Mohammed Emwazi (born Muhammad Jassim Abdulkarim Olayan al-Dhafiri; Arabic: محمد جاسم عبد الكريم عليان الظفيري‎‎; 17 August 1988 – 12 November 2015) was a British Arab alleged to be the person seen in several videos produced by the Islamic extremist group ISIL showing the beheadings of a number of captives in 2014 and 2015. A group of his hostages nicknamed him "John" since he was part of a four-person terrorist cell with English accents whom they called "The Beatles"; the press later began calling him "Jihadi John". On 12 November 2015, US officials reported that Emwazi had been hit by a drone strike in Al-Raqqah, Syria. His death was confirmed by ISIL in January 2016. Emwazi was born Muhammad Jassim Abdulkarim Olayan al-Dhafiri on 17 August 1988 in Kuwait to Jassem and Ghaneyah. The family, who were Bedoon of Iraqi origin, lived in the town of Al Jahra, before moving to the United Kingdom in 1994 when he was six. They settled in inner west London, moving between several properties in Maida Vale, later living in St John's Wood and finally in Queen's Park. Emwazi attended St Mary Magdalene Church of England primary school, and later Quintin Kynaston School. In 2006, he went to the University of Westminster, studying Information Systems with Business Management. He secured a lower second-class BSc (Hons) on graduation three years later. At age 21, he worked as a salesman at an IT company in Kuwait and was considered by his boss as the best employee the company ever had. Emwazi was given the nickname 'John' by a group of his hostages. The hostages said that he guarded Western hostages while handling communications with their families and was part of a terrorist cell they called 'The Beatles' because the cell members all had British accents. The nickname refers to John Lennon of the Beatles; the three other group members shared the first names of the other Beatles. The nicknames 'Jihadi John', 'Jailer John' and 'John the Beatle' were created by journalists. 'Jihadi John' was used on August 20, 2014 in the conservative British magazine The Spectator in a piece titled "Jihadi John – a very British export" by Douglas Murray, a frequent critic of Islam. The Daily Mail first used 'Jihadi John' in a piece dated August 21, soon after joined by the BBC and other sources. In a video uploaded to YouTube on 19 August 2014, Foley read a prepared statement criticising the United States, the recent airstrikes in Iraq, and his brother who serves in the United States Air Force. Emwazi, wearing a mask, also read a prepared statement in which he criticised America and President Barack Obama and made demands to cease the 2014 American-led intervention in Iraq. The masked man then beheaded Foley off-camera, after which he threatened to behead Steven Sotloff if his demands were not met. The FBI and United States National Security Council confirmed that the video, which included footage of Foley's beheaded corpse, was genuine. On 2 September 2014, a video was released reportedly showing American journalist Steven Sotloff's beheading by Emwazi. The White House confirmed the video's authenticity. On 13 September 2014, a video, directed at British Prime Minister David Cameron, was released, showing British hostage aid worker David Haines being beheaded by Emwazi. On 3 October 2014, a video released by ISIS showed Emwazi beheading British aid worker Alan Henning. Henning, a taxi driver from Salford, Greater Manchester, had volunteered to deliver aid to Syria. He was kidnapped in Al-Dana, an area held by ISIS, on 27 December 2013. On 16 November 2014 a video was posted by ISIS of Emwazi standing over a severed head, which the White House confirmed was that of Peter Kassig. Kassig's actual beheading was not shown, and unlike earlier hostage beheading videos he did not make a statement. The video that ended with a shot of Kassig's severed head showed the beheadings of 21 Syrian soldiers in gruesome detail, by a group led by a masked Emwazi. It was said by the BBC that, unlike previous videos, this one shows the faces of many of the militants, indicates the location as being Dabiq in Aleppo Province, and that this video "revels in gore." Unlike previous videos that cut away without showing the killing, Emwazi is shown beheading a victim. Haruna Yukawa, age 42, was captured sometime before August 2014. Kenji Goto, age 47, was captured sometime in October 2014 while trying to rescue Yukawa. In January 2015, a threat was issued that they would be killed unless the Japanese government paid a ransom of $200 million. Yukawa was beheaded on 24 January, and Goto on 31 January 2015. Officially the FBI and United States National Security Council confirmed that the James Foley video, which ended with footage of a beheaded corpse, was genuine. David Cameron and the British Foreign Office also confirmed the authenticity of the video showing the death of David Haines. The videos were produced and distributed by Al Hayat Media Center, a media outlet of ISIS that is under the authority of the ISIS's official propaganda arm, the Al-Itisam Establishment for Media Production, that targets specifically Western and non-Arabic speaking audiences. An unnamed forensics expert commissioned by The Times to look at the James Foley video said, "I think it has been staged. My feeling is that the murder may have happened after the camera was stopped." The Times concluded that "No one is questioning that the photojournalist James Foley was beheaded, but camera trickery and slick post-production techniques appear to have been used." Two unnamed video specialists in the International Business Times of Australia claimed that portions of the video appeared to be staged and edited. Dr James Alvarez, a British-American hostage negotiator, also claimed the James Foley video was "expertly staged", with the use of two separate cameras and a clip-on microphone attached to Foley's orange jumpsuit. Jeff Smith, Associate Director of the CU Denver National Center for Media Forensics, said "What's most interesting is that the actual beheading that takes place in the videos, both of them are staged." British analyst Eliot Higgins (Brown Moses) published photographic and video forensic evidence suggesting that the James Foley video was taken at a spot in the hills south of the Syrian city of Al-Raqqah. "Jihadi John" became the subject of a manhunt by the FBI, MI5, and Scotland Yard. In his videos, "Jihadi John" concealed his identity by covering himself from head to toe in black, except for tan desert boots, with a mask that left only his eyes visible. Despite this, several facts about "Jihadi John" could be ascertained from both videos. He spoke with an apparent London or southern England accent and appeared to have a skin tone consistent with African or South Asian descent. In both videos, he was seen to sport a pistol in a leather shoulder holster under his left shoulder, typical of right-handed people, but his actions in the videos suggest he is left-handed. Other factors that could have led to his identification were his height, general physique, the pattern of veins on the back of his hands, his voice and clothes. A team of analysts might use the topography of the landscape in the video in an attempt to identify the location. On 24 August 2014, the British Ambassador to the United States, Sir Peter Westmacott, said that Britain was very close to identifying "Jihadi John" using sophisticated voice recognition technology, but when pressed, refused to disclose any other details. On 20 September 2014, the United States Senate approved a $10 million reward for information that led to the capture of anyone involved in the murders of James Foley, Steven Sotloff and David Cawthorne Haines, which includes "Jihadi John". On 20 November, the bill, extending the potential scope of the reward program to any American kidnapped and murdered by a "foreign terrorist organization" and limiting the reward to a maximum of $5 million, was referred to the United States House Committee on Foreign Affairs. On 14 September British Prime Minister David Cameron confirmed that the identity of "Jihadi John" was known but had yet to be revealed. On 25 September, FBI Director James Comey told reporters that they had identified the suspect, but did not give information regarding the man's identity or nationality. "I believe that we have identified him. I'm not going to tell you who I believe it is," Comey stated. Michael Ryan, an author and scholar from the Middle East Institute speculated, "maybe 98 percent of 95 percent sure is not sure enough to put a man's name out." In August 2014, The Sunday Times reported that Abdel-Majed Abdel Bary ("L Jinny"), 23, a hip-hop musician from West London, had "emerged as a key suspect" in the investigation. Other sources also stated that Abu Hussain Al-Britani, 20, a computer hacker from Birmingham, and Abu Abdullah al-Britani, in his 20s from Portsmouth, were suspects. On 26 February 2015, The Washington Post identified the perpetrator as Mohammed Emwazi, a British man then in his mid-20s who was born in Kuwait and grew up in west London. The Washington Post investigation was undertaken by Souad Mekhennet and Adam Goldman. Emwazi was born to Iraqi parents who moved to neighbouring Kuwait from Iraq. When the Kuwaiti government rejected their application for citizenship, in 1994 they moved to Iraq and then on to Britain. According to his student card from the University of Westminster, Emwazi was born on 17 August 1988. Scotland Yard and 10 Downing Street declined to comment on the reports. The Counter Terrorism Command of the Metropolitan Police Service released a statement saying: "We are not going to confirm the identity of anyone at this stage or give an update on the progress of this live counter-terrorism investigation." The security services in the US and UK are believed to have known the identity of "Jihadi John" since September 2014, but have not revealed the name for operational security reasons. In an interview with The Washington Post, one of Emwazi's close friends said: "I have no doubt that Mohammed is Jihadi John. He was like a brother to me. ... I am sure it is him." Asim Qureshi, research director at the advocacy group CAGE, who had been in contact with Emwazi before he left for Syria, also identified the man in the videos as Emwazi, stating: "There was an extremely strong resemblance. This is making me feel fairly certain that this is the same person." US officials declined to comment for the Washington Post report, and Emwazi's family declined a request for an interview. Qureshi said that Emwazi was "extremely kind, gentle and soft-spoken, the most humble young person I knew". The BBC stated that Emwazi is believed to be "an associate of a former UK control order suspect ... who travelled to Somalia in 2006 and is allegedly linked to a facilitation and funding network for Somali militant group al-Shabab." He reportedly prayed on occasion at a mosque in Greenwich. He graduated with a degree in Information Systems with Business Management from the University of Westminster (2009). His final address in the UK before he went abroad was in the Queen's Park area of north-west London. The Post reported interviews with Emwazi's friends indicating that Emwazi was radicalised after a planned safari to Tanzania following his graduation. According to the interviews, Emwazi and two friends, a German convert to Islam named Omar and another man, Abu Talib, never made the safari. Rather, upon landing in Dar es Salaam in May 2009, the three were detained, held overnight by police, and eventually deported. In May 2010, The Independent reported on the episode, identifying Emwazi as Muhammad ibn Muazzam. According to e-mails sent by Emwazi to Qureshi and that were provided to the Post, after leaving Tanzania, Emwazi flew to Amsterdam, where he claimed that an MI5 officer accused him of attempting to go to Somalia, where al-Shabab operates. Emwazi denied attempting to reach Somalia, but a former hostage told the Post that "Jihadi John was obsessed with Somalia" and forced captives to watch videos about al-Shabab. Tanzanian officials have denied that they detained and deported Emwazi at the request of MI5, saying instead that he had been refused entry for being drunk and abusive. Later, Emwazi and his friends were permitted to return to Britain, where Emwazi met with Qureshi in late 2009. The Post quoted Qureshi as saying that Emwazi was "incensed" at the way he had been treated. Emwazi moved to Kuwait shortly afterward, where (according to emails he wrote to Qureshi), he worked for a computer company. Emwazi returned to London twice, however, and, on the second visit, he made plans to wed a woman in Kuwait. In June 2010, Emwazi was detained by counter-terrorism officials in Britain, who searched and fingerprinted him, and blocked him from returning to Kuwait. In an email four months later to Qureshi, Emwazi expressed sympathy for Aafia Siddiqui, an al-Qaeda operative who had just been sentenced in US federal court for assault and attempted murder. Qureshi said he last heard from Emwazi when Emwazi sought advice from him in January 2012. Close friends of Emwazi interviewed by the Post said that he was "desperate to leave the country" and one friend stated that Emwazi unsuccessfully tried to travel to Saudi Arabia to teach English in 2012. Sometime after January 2012, Emwazi travelled to Syria, where he apparently contacted his family and at least one of his friends. In March 2015, the media reported that his mother had recognised Jihadi John's voice as her son's; meanwhile, his father denied that this had happened or that Emwazi was Jihadi John. United States President Barack Obama condemned the actions of "Jihadi John" and vowed punishment for all the militants responsible for the videotaped beheadings. Secretary of State John Kerry also called "Jihadi John" a "coward behind a mask" and, echoing Obama, stated that all those responsible would be held accountable by the United States. British officials have also reiterated their commitment to capturing "Jihadi John". Admiral Alan West, a former UK Minister for Security and Counter-terrorism, said that he is a "dead man walking" who will be "hunted down" like Osama bin Laden. Prime Minister David Cameron also stated that he was absolutely certain that Jihadi John would "one way or another, face justice", and he also condemned the actions of "Jihadi John". UK Justice Secretary Chris Grayling, and Secretary General of Interpol Ronald Noble also stated that Jihadi John should be brought to justice. Reacting to the naming of Emwazi by the media, a spokesman for the family of Steven Sotloff told the BBC that they wanted to see him behind bars. Bethany Haines, daughter of David, said "It's a good step but I think all the families will feel closure and relief once there's a bullet between his eyes." Lord Carlile, a former independent reviewer of UK anti-terror laws, said, "Had control orders been in place, in my view there is a realistic prospect that Mohammed Emwazi, and at least two of his associates, would have been the subject of control orders with a compulsory relocation." In reaction to the revelation, Emwazi's father, Jassem, has said that he is ashamed of his son. Previously, when he learned from his son that he was going to Syria "for jihad", Jassem had told him that he hoped he would be killed. But the day after the naming he issued a statement denying that his son was Jihadi John. An unidentified cousin issued a statement which said, "We hate him. We hope he will be killed soon. This will be good news for our family." On 8 March 2015, according to The Sunday Times, Emwazi apologised to his family for "problems and trouble the revelation of his identity has caused" them. The message was conveyed via an unspecified third party. On 12 November 2015, two United States drone aircraft along with a British drone reportedly conducted an airstrike in Al-Raqqah that targeted Emwazi as he left a building and entered a vehicle. US officials stated he had been killed, but his death had not been confirmed at the time and data was still being analysed. A senior US military official was quoted as saying, "we are 99% sure we got him." A US official called it a "flawless" and "clean hit" with no collateral damage and that Emwazi was "evaporated." On 14 December 2015, US President Barack Obama stated Emwazi had been "taken out". UK Prime Minister David Cameron stated the US and Britain had been working "hand in glove, round the clock" to track Emwazi's location, and that the drone strike was "an act of self-defence." On 19 January 2016 in the ISIL magazine Dabiq, the group confirmed that Emwazi had been killed by a drone strike in Al-Raqqah. The obituary showed him unmasked and referred to him as Abu Muharib al-Muhajir. Further photographs showing him unmasked in Syria were released on 26 January 2016. 1 2 3 "First Photo of 'Jihadi John' As Adult Revealed". Sky News. 27 February 2015. ↑ "Mother recognised Mohammed Emwazi's voice on hostage videos". BBC. 2 March 2015. 1 2 3 "'Jihadi John': Why do we give notorious criminals nicknames?". The Independent. 2 March 2015. ↑ "British doctor could lead to jihadist 'John the Beatle". New York Post. 22 August 2014. ↑ "The hunt for British jihadist 'Jailer John'". The Times. 21 August 2014. ↑ "Dozens of jihadis in fighting in Syria using the name 'al-Britani'". The Independent. 27 February 2015. 1 2 3 "Jihadi John: A quiet man who hated Britain and was 'always ready for war'". ITV News. 25 February 2015. ↑ "Mohammed Emwazi Revealed As Jihad John: What We Know About Islamic State's Most Wanted Man". The Huffington Post. 2 March 2015. ↑ "Mohammed Emwazi: Man identified as Isis killer 'Jihadi John' 'stopped by MI5' while on safari holiday in Africa in 2010". The Independent. 26 February 2015. ↑ "The moment Jihadi John may have become a terrorist". The Washington Post. 2 March 2015. 1 2 "Among the Believers are Men: Abū Muhārib Al-Mujāhir.". Dabiq No. 13 (January 2016 / 1437 Rabi Al-Akhir), page 21. Retrieved 2016-01-19. 1 2 3 "Who is Mohammed Emwazi? From 'lovely boy' to Islamic State killer". The Guardian. 2 March 2015. 1 2 "'Jihadi John' Used To Be 'Kind And Gentle'". Sky News. 27 February 2015. ↑ "Jihadi John: Student record of Mohammed Emwazi leaked". The Daily Telegraph. 27 February 2015. 1 2 3 4 "'The best employee we ever had': Mohammed Emwazi's former boss in Kuwait". The Guardian. 2 March 2015. 1 2 3 "'Jihadi John': high degree of certainty US airstrike killed Mohammed Emwazi, sources say". The Guardian. 13 November 2015. ↑ "Spies were so much on Emwazi's case they bought his computer". The Australian. 3 March 2015. ↑ "'Jihadi John' born into stateless family in poor corner of wealthy Kuwait". CTV News. 2 March 2015. 1 2 "Islamic State: Profile of Mohammed Emwazi aka 'Jihadi John'". BBC News. 27 February 2015. 1 2 "On the trail of Jihadi John, the slaughterer from Maida Vale". The Daily Telegraph. 27 February 2015. p. 2. ↑ Hamilton, Fiona (27 February 2015). "Pious teenager who turned intoa zealot and heartless murderer". The Times. p. 2. (registration required (help)). ↑ "How London rapper L Jinny became Jihadi John, suspected of beheading James Foley". The Sydney Morning Herald. 5 August 2014. ↑ Douglas Murray (August 20, 2014). "Jihadi John – a very British export". The Spectator. Retrieved December 23, 2015. ↑ David Williams (August 21, 2014). "Sadistic reign of 'jihadi John': British murderer brutally beat hostages and staged terrifying executions before demanding £80million ransom to free US journalist he later beheaded on video". Daily Mail. Retrieved December 23, 2015. ↑ "'Jihadi John', fears for Gazza and GCSE 'ghost of Gove' in headlines". BBC News. 22 August 2014. Retrieved 23 December 2015. 1 2 3 4 5 6 7 8 9 Rayner, Gordon (20 August 2014). "Video clues that could unmask James Foley's murderer". The Daily Telegraph. Retrieved 24 August 2014. ↑ Paul Lewis (2 September 2014). "Isis video purports to show execution of US journalist Steven Sotloff". The Guardian. Retrieved 2 September 2014. ↑ Joshua Rhett Miller/AP (3 September 2014). "White House confirms authenticity of ISIS video showing beheading of reporter". Fox News Channel. Retrieved 3 September 2014. ↑ "ISIS executes British aid worker David Haines; Cameron vows justice". CNN. 13 September 2014. ↑ "World reacts to IS video showing apparent killing of Alan Henning". BBC News. Retrieved 4 October 2014. ↑ "Alan Henning: An ordinary man who wanted to help Syrians". BBC News. ↑ "U.S. review of Islamic State video confirms American's death". USA Today. 16 November 2014. ↑ "Abdul-Rahman Kassig: US hostage 'killed by IS'". BBC News. ↑ "Islamic State threatens two Japanese captives in video". Reuters. 20 January 2015. ↑ "Islamic State crisis: Jordan air strikes 'destroy' IS hideouts". BBC News. 8 February 2015. ↑ CThe Associated Press (14 September 2014). "David Haines beheading: British PM vows to 'hunt down those responsible'". Canadian Broadcasting Corporation. ↑ Christoph Günther (20 August 2014). "Der 'Islamische Staat' agiert hochgradig rational". Deutsche Welle. ↑ Deborah Haynes (25 August 2014). "Foley video with Briton was staged, experts say". The Times. Retrieved 27 August 2014. ↑ "James Foley Beheading Video Has Play-Acting Portions – Video Experts Say". International Business Times of Australia. 23 August 2014. Archived from the original on 22 August 2014. Retrieved 23 August 2014. ↑ "Media Forensics Experts Analyzing ISIS Video in Denver". Retrieved 15 September 2014. ↑ "France 24: Exécution de James Foley: la traque de 'Jihadi John' est lancée". France 24. Retrieved 11 September 2014. ↑ "Bellingcat: The Hills of Raqqa – Geolocating the James Foley Video". Retrieved 11 September 2014. ↑ "Is this where James Foley was killed?". CNN. Retrieved 11 September 2014. 1 2 3 4 Nick Allen; Philip Sherwell (20 August 2014). "Hunt for 'British' Islamic State killer of US journalist James Foley". The Daily Telegraph. Retrieved 20 August 2014. ↑ Sparrow, Andrew (20 August 2014). "PM returns from holiday after video shows US reporter beheaded by Briton". The Guardian. Retrieved 20 August 2014. ↑ "Uncovering James Foley's killer". The National. 21 August 2014. Retrieved 22 August 2014. ↑ Gordon Rayner; Alastair Beach; Martin Evans; Philip Sherwell (20 August 2014). "Hunt is on for ISIS terrorist: Video yields clues to identity of American journalist's left-handed executioner". National Post. Retrieved 3 September 2014. ↑ Joshua Rhett Miller (3 September 2014). "White House confirms authenticity of ISIS video showing beheading of reporter". Fox News Channel. Retrieved 3 September 2014. ↑ Sherwell, Philip (24 August 2014). "Britain 'very close' to identifying 'Jihadi John' – suspected killer of James Foley – says ambassador". The Daily Telegraph. Retrieved 24 August 2014. ↑ Almasy, Steve (26 August 2014). "Britain close to identifying James Foley's killer, ambassador says". CNN. Retrieved 26 August 2014. ↑ "US Senate Approves $10m Bounty for James Foley and Steven Sotloff ISIS Killers". 20 September 2014. Retrieved 22 September 2014. ↑ "The British connection to ISIS beheadings". CNN. 14 September 2014. Retrieved 14 September 2014. 1 2 Crompton, Paul (26 September 2014). "FBI: U.S. identifies ISIS hostage executioner". Al Arabiya. Retrieved 26 September 2014. ↑ Winter, Michael (25 September 2014). "FBI chief: ISIS militant in beheading videos identified". USA Today. Retrieved 26 September 2014. ↑ Richard Kerbaj, Marie Woolf and Nicky Harley, London hip-hop artist key suspect in beheading, Sunday Times, 24 August 2014. 1 2 "London rapper Abdel-Majed Abdel Bary investigated as police hunt for 'Jihadi John'". London Evening Standard. 23 August 2014. Retrieved 24 August 2014. ↑ "London hip-hop artist Abdel-Majed Abdel Bary key suspect in hunt for killer of American journalist James Foley". News.com.au. 25 August 2014. 1 2 3 4 5 6 7 "'Jihadi John': The Islamic State killer behind the mask is a young Londoner". The Washington Post. 26 February 2015. 1 2 3 "'Jihadi John' named as Mohammed Emwazi from London". BBC News. 26 February 2015. ↑ "'Jihadi John' From ISIS Execution Videos Was Under Watch by British Intelligence". The New York Times. 26 February 2015. ↑ "Parents of IS Executioner Iraqi". Arab Times. 1 March 2015. ↑ "Jihadi John named as Mohammed Emwazi, from west London". The Daily Telegraph. 26 February 2015. ↑ Julia Macfarlane Twitter Statement from #SO15" "Met Press Office on BBC's naming of #JihadiJohn #ISIS militant as Mohammed Emwazi from London". Retrieved 26 February 2015. ↑ "Mohammed Emwazi: Tanzanian officer recalls airport arrest". BBC News. 8 March 2015. ↑ "Mother recognised Mohammed Emwazi's voice on hostage videos". BBC News. 2 March 2015. 1 2 "Mohammed Emwazi's father: no proof my son is Isis executioner". The Guardian. 4 March 2015. 1 2 "After Beheading of Steven Sotloff, Obama Pledges to Punish ISIS". The New York Times. 3 September 2014. ↑ "Jihadi John is 'dead man walking', says former security minister – Telegraph". The Daily Telegraph. 3 September 2014. Retrieved 11 September 2014. ↑ "David Cameron 'absolutely certain Jihadi John will be caught' – Telegraph". The Daily Telegraph. 4 September 2014. Retrieved 11 September 2014. ↑ "Alan Henning murder: David Cameron vows to defeat ISIS". The Guardian. 4 October 2014. Retrieved 7 October 2014. ↑ Whitehead, Tom (16 September 2014). "Jihadi John known to MI5 but may never be brought to justice". The Daily Telegraph. Retrieved 19 September 2014. ↑ "Sotloff family want 'Jihadi John' jailed". BBC News. Retrieved 26 February 2015. ↑ "Mohammed Emwazi: We won't get closure until there's a bullet between his eyes, says widow of aid worker David Haines". London Evening Standard. 27 February 2015. Retrieved 1 March 2015. ↑ "Jihadi John, UK ISIS Murderer, 'Emailed Mail on Sunday Journalist About Security Services'". The Huffington Post. 1 March 2015. ↑ "Jihadi John: Father accuses Mohammed Emwazi of being a 'dog' and 'terrorist'". The Telegraph. 3 March 2015. ↑ "Security probes links to Emwazi". Arab Times. 3 March 2015. 1 2 "U.S. Airstrike Targets Notorious ISIS Militant 'Jihadi John'". Fox News Channel. Retrieved 13 November 2015. ↑ "Jihadi John: US air strike 'targets Mohammed Emwazi in Syria'". BBC News. 13 November 2015. Retrieved 13 November 2015. 1 2 Brian Ross (12 November 2015). "'Jihadi John' Believed Killed in US Drone Strike, US Officials Say". ABC News. Retrieved 13 November 2015. ↑ "Strikes Target ISIL Executioner, Other Terrorists in Syria, Iraq > U.S. DEPARTMENT OF DEFENSE > Article View". Defense.gov. Retrieved 2015-11-15. ↑ "Remarks by the President on the Military Campaign to Destroy ISIL". whitehouse.gov. 14 December 2015. Retrieved 15 December 2015. ↑ Chan, Sewell; De Freytas-Tamura, Kimiko (13 November 2015). "Pentagon Says 'Jihadi John' Was Probably Killed in Airstrike". The New York Times Company. The New York Times. Retrieved 14 November 2015. ↑ "Isis confirms 'Jihadi John' was killed in drone strike". The Independent. 20 January 2016. 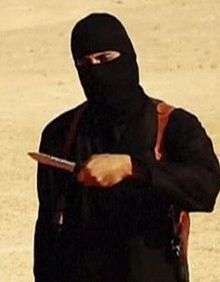 ↑ "First pictures of 'Jihadi John' without mask in Syria". ITV News. 26 January 2016. Retrieved 28 January 2016.